Even with a talent as extraordinary and effortless as the one possessed by Vanessa Redgrave who manages to sprinkle a little magic into every one of her scenes in Gary Winick's less than magical film, it's fairly easy for the idyllic Italian countryside and scenic beauty of the fair city of Verona to upstage nearly everything in its path in Letters to Juliet. It's the same fate of scenery fighting with the predictable limitations of a by-the-numbers romantic comedy screenplay that threatened to do in 2010's Irish set Anand Tucker title Leap Year starring Amy Adams but luckily for Leap there was enough originality sprinkled in to save it, which cannot be said for Juliet. Despite this, it's sure to do wonderful box office business for women as a very welcome multi-generational offering that could reach audiences from teens to seniors a la My Big Fat Greek Wedding. Still, the surprisingly dull screenplay penned by Jose Rivera -- one of the writers of Motorcycle Diaries -- and Tim Sullivan wastes a rather extraordinary premise of a lost fifty-year old letter found at the site of Juliet's home in Verona where tourists from around the world either send notes or attach them to the wall before the real life volunteer secretaries of Juliet answer each and every one that includes an address. Inspired initially by the Elvis Costello album “The Juliet Letters” along with Lise and Ceil Friedman's nonfiction book about the Verona courtyard tradition, it's turned into the stuff of less than intelligent chick lit on screen when the never-believable Amanda Seyfried's fact checker Sophie Hall for The New Yorker stumbles upon a long lost letter sent by Redgrave back when she was a teen torn between her home in England and her Italian love (played by her real-life husband Franco Nero). 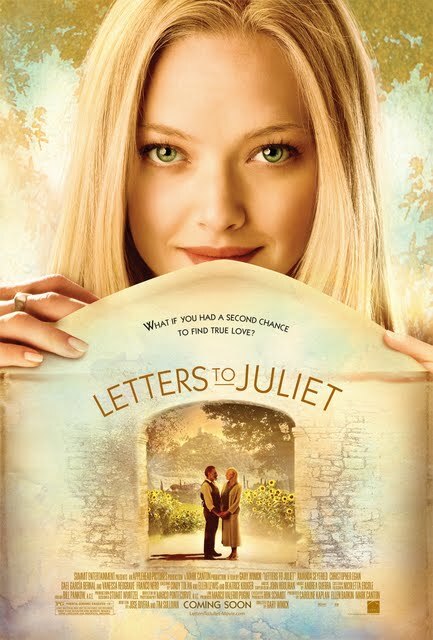 In Italy, Sophie spends a full day replying to her letter and when the only-in-the-movies postal service manages to reach England within a day, Redgrave's Claire and her grandson Charlie (Christopher Egan) somehow arrive shortly thereafter, thanks to the fastest mail delivery system in history. Bound and determined to track down Claire's long lost love much to the chagrin of Charlie who fears that it will just cause pain, Sophie unexpectedly decides to tag along, feeling it's precisely the type of story she should be writing as an aspiring journalist. And luckily, with her fiance Gabriel Garcia Bernal (one of the few bright spots in the movie as the much-needed comic relief) gallivanting around the countryside to a wine auction in preparation for his restaurant opening back in New York, Sophie spends her pre-honeymoon apart from her alleged beloved, causing her to reevaluate her relationship especially when the constant bickering with Charlie turns into the first flutters of attraction. Although Claire's storyline would be interesting enough, it's obvious for market value as a genuinely romantic story that the filmmakers wanted to double up on the love story but the only problem is that we never buy the chemistry between Seyfried and Egan and moreover, Egan's character initially is so much of a brute that we actually prefer Bernal's absent character to the pompous jerk. Of course and rather conveniently, Charlie reveals the true Prince Charming he actually is beneath the wolf's clothing but it's hardly the star-making swoon-worthy male lead role you'd dream about. Certainly it's pleasant, cookie-cutter cinema of the most predictable kind and worth the price of admission for the luminous Redgrave as well as the breathtaking shots of Italy that provide a refreshing change of pace from guns and steel of summer blockbuster season. But ultimately for a movie about an aspiring writer, it's ironic that we really needed a stronger writer aboard to give the script the complete rehaul necessary to truly win our hearts, making me wonder if perhaps one or more of Juliet's real-life secretaries wouldn't have been a better fit.